Second issue of the literary magazine published by Rod Serling's widow, based on the famous TV show. 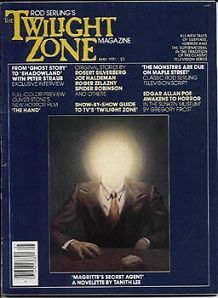 Features cover art by Magritte. This mag was around in the 1980's but I don't think it's around anymore. The early issues printed a Show-By-Show guide of the classic TV series and often included actual scripts from the show. Website design and hosting by Sohodojo Business Services. Item 442 of 466 items displayed in viewer. 0 items in cart.